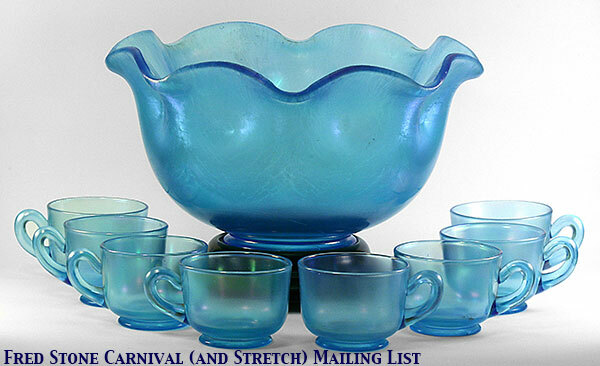 A couple of weeks ago when Cal was talking about large pieces of stretch glass, he mentioned a very large Diamond paneled “punch bowl” that actually looked more like a wash basin. It is one huge heavy cobalt blue piece of stretch glass! It is 5 1/2” high and 15 1/2” wide. The bedroom pitcher that is sitting in the bowl looks small compared to the bowl. 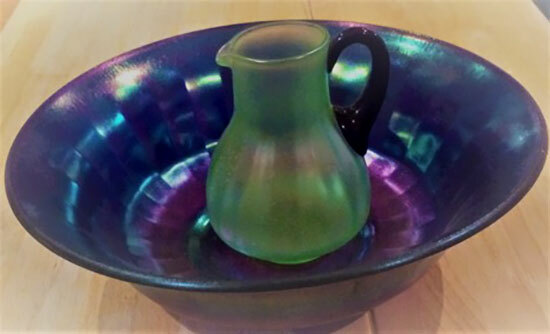 Berry Wiggins called one evening years ago saying that he had a stretch glass bowl that we needed to add to our collection. We were excited until he told us about the size of the bowl. Every conversation after that he would mention the bowl. Russell flew back to Ohio for a Stretch Glass Convention and saw the bowl. He loved it, but not enough to purchase a second seat on the plane for the bowl! 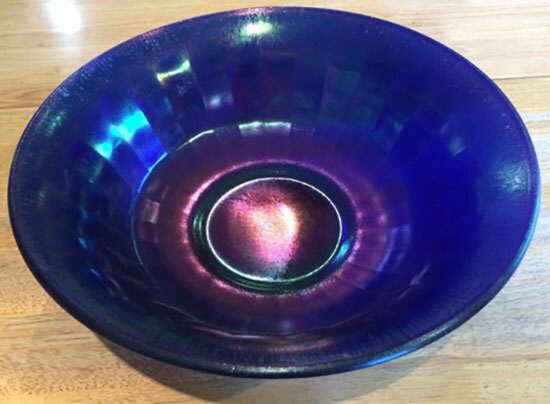 Berry sold the bowl to John Madeley, co-author with Dave Shetlar, the American Iridescent Stretch Glass book. Every time we talked to John, we had the same conversation as we had with Barry. In 2005, we drove back to the Stretch Glass Society convention. The moment we saw John, he said he had our bowl with him. The bowl in the box took up 1/8 of the back of the van! Yes, we are very happy that we have the bowl and that Barry and John saved the bowl for us. But it does take up a lot of room. We have lost Barry and John, but we honor their memories every time we look at the bowl. Our beautiful glass is a joy in our lives, but how we acquired each piece and the friends that we have made along the way are what collecting is all about. And a final note. A big thank you to all of the firefighters for their their tireless efforts to save our lives, animals, and homes.